The Honda Civic’s fuel-stingy heritage is more than legend. While it might seem hard for some to believe nowadays, eighties and nineties Honda Civic gas mileage ratings were extraordinary, with highway numbers that ranged into the forties and fifties. History cannot be rewritten when documentation exists to prove the facts. There are a number of things to consider when looking at the high MPG numbers of the eighties and early-to-mid nineties, with the first being the national speed limit that was in effect at the time. The national 55 mile per hour (MPH) speed limit became effective in early 1974 as a result of the 1973 oil crisis. The national limit was raised to 65 MPH in the late eighties and remained in effect until 1995, when the federal limits were repealed. Surely we’ve all heard the oft-repeated chestnut that lower highway cruising speeds allow for higher fuel efficiency. What isn’t said is that the actual percentage will vary from vehicle-to-vehicle, due to variables that include aerodynamic efficiency, gearing, and torque … in addition to environmental and geographic conditions. The two-seat CRX debuted in the 1984 model year, equipped with a 60 horsepower 1342cc engine and a curb weight of just 1713 pounds. The initial EPA fuel economy estimates were nothing short of astounding at 51 city / 67 highway miles per gallon (MPG). Gas mileage ratings dropped to a more believable 49 city / 54 highway when the CRX HF appeared in 1985 The 1986 and 1987 Civic CRX HF ratings nudged back up to 57 highway. 1988 saw the second-generation CRX with an arguably more attractive design. The high fuel-efficiency HF version of the two-seater continued to be offered through the CRX’s final model year in 1991, with the highway mileage rating slipping back to 52 MPG. 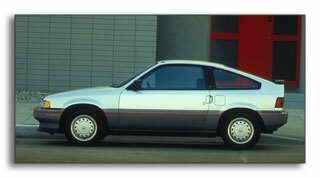 Throughout its run, the CRX HF was only available with a five-speed manual transmission. Honda introduced the Civic VX hatchback in the 1992 model year, replacing the departed CRX at the top of the company’s MPG charts. Like the CRX HF, the Civic VX was sold exclusively with a five-speed manual; both were fitted with a 1.5-liter inline four. 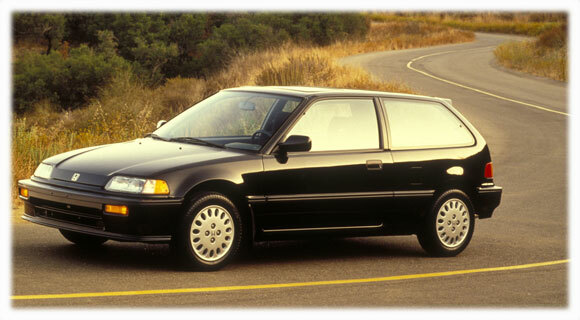 The 1992 Civic VX was rated at 48 city / 55 highway. 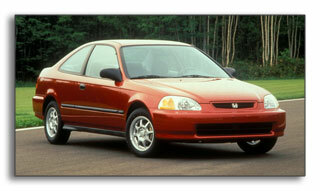 The hatchback VX was replaced with the Civic HX Coupe in the 1996 model year. While the HX Coupe claimed the highest fuel economy in Honda’s line up in 1996, the MPG ratings dropped to 39 city / 45 highway for the five-speed manual. A continuously-variable automatic transmission (CVT) was offered for the first time in the 1996 Civic HX, with mileage ratings of 35 city / 39 highway. Displacement grew to 1.6 liters in the 1996 model year. 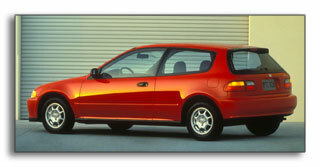 The Civic HX hung around through the 2005 model year, with displacement bumping up to 1.7-liters in 2001. 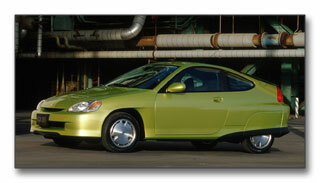 Honda was at the top of its game when the Insight Hybrid appeared in the company’s 2000 lineup. While some folks thought the two-seater invoked an entirely new Jetsonian vision of the future, long-time Honda watchers saw it as a tweaked-out CRX with rear fender skirts. The tiny 1.0-liter three-cylinder hybrid system was exclusively mated to a five-speed manual transmission and rated at a positively remarkable 61 city / 70 highway MPG in its introductory year. A CVT version was introduced in 2002, with both manual and CVT versions offered through the original Insight’s run that ended in 2006. 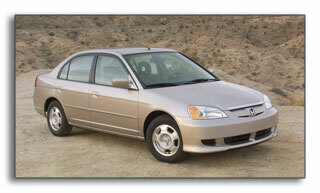 The Honda Civic Hybrid arrived in 2003, sporting a 1.3-liter inline four, mated to either a five-speed manual or CVT. The 2003 Civic Hybrid was rated at 46 city / 51 highway with the manual transmission and 48 city / 47 highway with the CVT. If you’re in the market for a cheap high-MPG car, older Honda Civics always rise to the top of the list. The Civic’s legendary reliability has ensured a plentiful supply of vehicles. While the lightest of the bunch (CRX HFs and Hatchback VXs) have been snapped up by tuners and wannabes, it isn’t a stretch to find a clean HX Coupe at a reasonable price. Worth Noting: The vast majority of gasoline sold in America today contains approximately 10% ethanol and is referred to as E10. 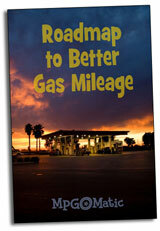 Ethanol contains 30% less energy than gasoline per gallon, which results in lower MPG results. The degree to which E10 reduces fuel-efficiency over “pure” gasoline is often contested. With a ten percent blend, one might expect a three percent drop. But these numbers may change, based upon the characteristics of each vehicle. Why Hasn’t Gas Mileage Risen? 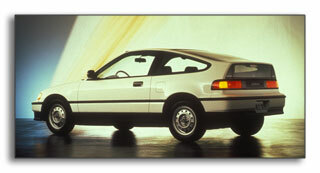 I wouldn’t mind owning an old 88 Honda CRX again… I miss those little cars. Still driving the 87 CRX I bought new. Just bought another for my daugher (1 year old). Honda sure did lose its way. Why doesn’t this article mention the 1983 Honda Civic 1300FE “Fuel Economy” model? It was one of the best cars I ever owned and I averaged 50+ mpg in mixed driving. I sold it to a friend when it had 135K on it because I was worried that it was going to start having problems. My friend put another 230K on it without a single problem. At another site I saw that this car was rated at 47 city/59 highway.